Most of us believe face cleansing is limited to washing the face with soap or a face wash that is only a part of the face cleansing regime. Face cleansing refers to the removal of dead skin cells, pollution, oil and dirt visible on the skin surface. There are various ways of face cleansing, including natural cleansers like rose water or artificial milk cleansers along with additional homemade cleansers with fruits, vegetables and various other ingredients. Face cleansing if done every day helps get a glowing skin, however if you opt for occasional cleansing that will also help, as there are many instant glow cleansing creams available. 1. Face washing- The first step in the whole process of face cleansing is, face washing. This will remove all the impurities and make up on your skin. We should make sure to use a face wash or soap that is according to our skin type and too harsh on the skin. If you have make up on, remove make up before washing the face, with oil or make up remover. As often all the make-up does not come off even after washing. 2. Scrubbing- After washing the face use a scrub on wet skin to deep clean it and make it look shinier. This step is not for people with very soft and sensitive skin as they are usually irritable to coarse nature of scrubs. People with blackheads should prefer scrubbing. You can also choose to exfoliate using a mild scrub and not a harsh scrub brush. 3.Steaming- Hot water vapor steam helps deep clean your face as it opens all closed pores due to heat and increases oxygen level of the skin making it glow more. This is the most reliable and safe way of bringing facial glow. This step is optional however you can do it as many times as you want, it does not harm you. 4. 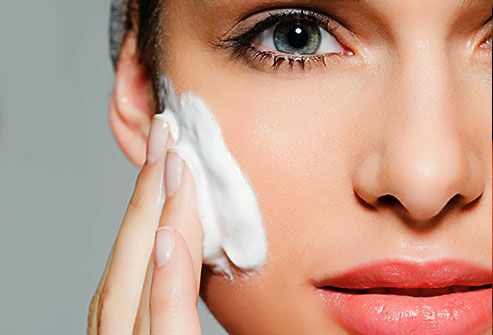 Moisturizing-After scrubbing, pat dry the face and apply some moisturizer on it. While applying the moisturizer, do not rub your cheeks in a circular motion, and instead push them upwards, towards your ears. This will keep your skin lifted up always. Make sure to use a moisturizer according to the weather, thick moisturizers in hot and humid weather will make your face look oily and unclean. So choose wisely. 5. Cleansing- It is often argued what is the best time of the day for cleansing the face. Usually you should opt for doing it during the night before sleeping. After using cleansers on the skin we need to give it rest, therefore cleansing before going to work or during the beginning of the day does not work all the time. Night is the preferred time for face cleansing regime.